"Migs Damiani has come up with a winner. Here is a book you can open to almost any page and get useful information. You can spend a few minutes reading a chapter and get some profound thinking and solid advice. Creative Leadership gives specific, clear-cut directions not just for those who are in leadership positions, but those who want to be more, do more, and have more. He ties it all together in an interesting and informative way, and hits major points with bullet-like precision, effectively using "nuggets" of information that you can use in your personal, family, and business life." become leaders and to grow in leadership. This is a book that can be read again and again for continual inspiration and reminders." "I've always been puzzled over how few of our leaders know how and what can be done to involve and motivate employees. This is probably why we have so many managers and so few true leaders. Creative Leadership addressed these issues very well and should be read by anyone in a leadership position today, or hopeful of being a leader in the future."" Michael Kelly, Director, Corporate Real Estate, PRC Inc.
"For every manager who aspires to lead, for every first line supervisor who aspires to the next level of leadership, and for every individual who aspires to significantly change the world, Migs has collected an inspiring manual of leadership tools and techniques!" "The most important asset of companies will be their intellectual capital. The keys to cultivating the human intellect are addressed in Creative Leadership. The book is about leadership skills needed to nurture personal and professional growth among employees and others." "Creative Leadership is a book that explains, among other things, the difference between managing (things) and leading (people). Anyone who is responsible for the productivity of other people and who doesn't know the difference between managing and leading can learn many important lessons from this book." "I've always been puzzled over how few of our leaders know how and what can be done to involve and motivate employees. This is probably why we have so many managers and so few true leaders. Creative Leadership addresses these issues very well, and should be read by anyone in a leadership position today, or hopeful of being a leader in the future." -Michael Kelly, Vice President-Corporate Real Estate, PRC Inc.
"Wherever you are in your journey through the densely populated forest of leadership aids, this book IS the next step. Every page whittles a bit more of the bark from the boughs of seasoned, mature leadership, revealing a system of leading others that is strongly rooted in the rough and tumble realism of day-to-day business. Follow along as Migs helps you spawn new growth in others, and gives you all the tools you'll need to nurture, prune and strengthen the leaders of tomorrow who are reporting to you today. ;"
"Migs has injected his personal knowledge of people skills into his writing in a way that can be easily understood and implemented. This 'how to ' book is a winner. I'm impressed!" "During his distinguished career, Migs Damiani has POSITIVELY affected thousands of peoples' lives and careers. 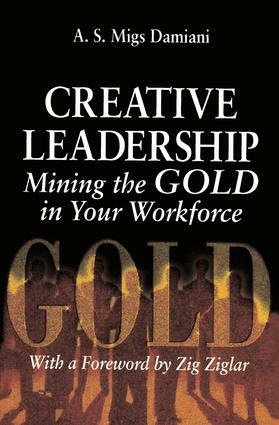 In his new book Creative Leadership, he shares his success formula with you to build more effective leaders-by looking for and mining the gold in your workforce-and to develop your people skills." "Managers owe it to their associates and themselves to move beyond the management of things to the leadership of people. This book is a terrific step forward toward that goal. Migs has flavored the broth of his own extensive experience with Bill Bennett's Book of Virtues, Canfield and Hasen's Chicken Soup for the Soul, Covey's Principle-Centered Leadership, and a heavy portion of Zig Ziglar's See You at the Top. " "Migs Damiani not only talks the talk, he walks the talk. Everything you'll read in this book represents Migs' style of leadership, and provides us with a model that will serve us well if we are to be successful in the twenty-first century." "Creative Leadership takes complex issues and provides simple, practical steps in creating an environment that is both rich and exciting for the employee as well as the company. The success stories t are included show how the principles and steps that are detailed work in actual situations. Migs has written a book that is not only extremely informative, but is both enjoyable and inspirational. His book clearly shows that leaders are not limited to the management staff, but can be any member of the organization."